Watch Sharon Read Her Story The Proud Ostrich! The Proud Ostrich by Sharon is a creative retelling of a traditional village story by an 7th Grader at Daylight! 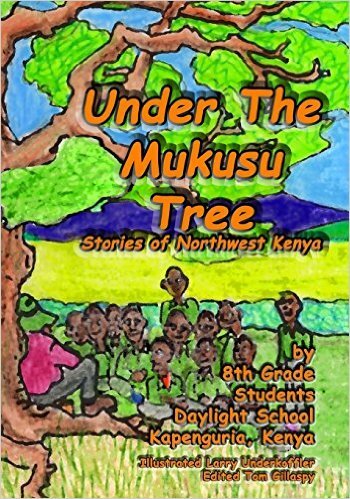 It is one of many in “Under the Mukusu Tree,” a collection of stories written by our students. Long ago, there was a great famine in the land. There was not a drop of rain for many months. Day after day, the sun shone and there was not a cloud in the sky. There were a few crops on the banks of tiny streams, but the rest of the land was dry and bare. Fires spread far and wide and there were many dust storms. Birds could not sing any longer as they were so hungry. The wild animals thought they would all die unless rain fell in the next few days. But day after day, the sky was clear. Water was so scarce that the lions even began to drink the morning dew from the grass. The hyenas and jackals also drank the dew, as did the moles and the fox. They prayed that someday soon, there would be enough for all them to drink. However, it appeared as if their prayers would not be answered. The animals decided to have a meeting to see if they could think of a way to save their lives. The ostrich joined in, as well. It was agreed that he was more like an animal than a bird. All the animals joined in except those who were sick. There were all kinds, big and small, young and old, flesh-eaters and grass-eaters. It was sad to see them so unhappy and sickly. They were all as thin as pieces of thread. When Lion, their king, arrived, they all stood up. “Without water, we shall die,” they cried. For a time, no one spoke, not even the brave leopard or the cheeky hare. Only the aged tortoise said, quietly, that the lion’s idea was very wise. The moles, the anteaters and the other small creatures were frightened when they thought how deep the hole would need to be before they could reach water. But, no one could think of a better idea. Lion decided they should all start to dig the well the next day. Once Lion makes a decision, it is final! At dawn, Giraffe blew the horn very loudly, so no one could say he had not heard it. Jackals, hyena, moles, anteaters, tortoise, rats, ostrich, zebra, and many other animals arrived. They all came with spades and shovels and started to work. Though they were all very weak, because they had had neither food nor water for so long, they worked as hard as they could. They wanted to finish the well in one day. Suddenly, hare noticed that ostrich was not working. Instead, ostrich flapped his wings about in a proud way. This made the other animals very cross. “You take the shovel, next,” Hare said to Ostrich. When the other animals heard this, they chased Ostrich away. Digging the well was hard and dangerous. Five rats, one gorilla, three moles and two tortoises died while they were working. But, finally, they reached water. All the animals jumped up and down and danced when they saw the water. They were mad with joy. They all drank and some washed themselves, while ducks swam about happily. Hippo was very kind, and when Ostrich gave him some feathers, he said Ostrich could drink as much water as he liked. But this time, Donkey was on duty and not Hippo. Donkey was very angry when he heard Ostrich and was not going to let him drink water from the well. Just as Ostrich bent down to drink, Donkey gave him a hard kick. Ostrich ran away and has not been seen since.